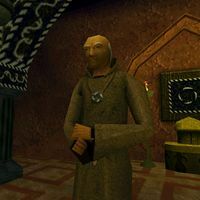 Nidal, often referred to as Brother Nidal, is a priest of Arkay and the only one of his kind on the island of Stros M'Kai, since the disappearance of his initiate and good friend, Brother Kithral. He offers healing services for 25 gold, or for free if you retrieve Kithral's journal for him. He wears an amulet with the symbol of his temple. As a holy man, he does not concern himself with political, secular affairs, unlike his initiate. What he does reveal is that he holds disdain for both the Empire and the Crowns, due to his general dislike of political affairs. However, he still holds allegiance to the Crowns, hiding the body of their leader in his temple. He is one of the more talkative characters, and he offers plenty of mostly unbiased background information on the political situation of Stros M'Kai, as well as some information on Iszara. When you give him Kithral's journal, Nidal will reveal that Prince A'tor is hidden in the temple. He was not aware of the soul gem containing the Prince's life force, thinking the only reason not to bury him was N'Gasta's soul snare. Nidal also makes a brief appearance in the cutscene for the quest Raze the Palace. He and Cyrus open the central tomb with the Prince's body, then Saban performs the soul gem ritual. The Archmage's Ring: Follow in Kithral's footsteps to locate Archmage Voa and his ring. Nidal's race is difficult to determine from his appearance or related dialogue, though he is most likely a Redguard or Imperial. The topics "Iszara", "Stros M'Kai", and "Temple" are supposed to disappear after the quest Rescue Iszara, but the variable that implements this is never set. Brother Nidal welcomes Cyrus and Saban into the temple and helps Cyrus open A'tor's tomb. "Hello, Brother. I'm Cyrus, recent to this shore." "Brother Nidal, good son. Welcome to the Temple of Arkay." "It is good to see you, Cyrus." "Can you heal me, Brother Nidal?" "Please forgive the formalities, but the Governor has levied a temple tax of 25 gold for any magical services rendered, healing or otherwise. Will you pay the tax?" "I need you to tend to my wounds again, Brother." "I must ask you to pay the temple tax, of course. Will you?" "I see nothing wrong with you, my boy. Count your blessings." "You haven't the gold, I see. "Remember these are the Governor's rules, Cyrus, not our blessed Arkay's. I am sorry that I cannot help you." "I am truly sorry, but I cannot help you, then." "My sister, Iszara, has been missing for near three months. Perhaps you have heard of her?" "I knew her well, actually, but she never mentioned having a brother. She was a fiery sort, as I'm sure you know, and her Redguard blood did not fare well under Imperial rule. "She is not the only nationalist who has disappeared since the Governor claimed the city. There have been others." "Brother Kithral, my initiate and good friend, for one. He was an outspoken man, and a Crown sympathizer. "He was enamored of your sister, I must say, and took to her Crown propaganda readily." "Before she what, Brother Nidal?" "Well, man, before she vanished!" "I trust that you will seek me out if you hear anything more of my sister." "I will be honest, Cyrus. She is either dead or worse, for I know she would not have left Stros M'Kai, even after A'tor's defeat. "Richton had a list of rebels when he took the throne, and Iszara's name was undoubtably upon it." "Are you a follower of Arkay, Cyrus?" "Me? No. Well, not in the worshipper sense." "I'm not that wayward, Brother, I do believe in the gods, and in their, you know, importance to man and all that." "And Arkay's importance would be...?" "I'm usually the one who asks all the questions, Brother Nidal." "Arkay, then: the shepherd of the soul, who watches us through our lives and our deaths, who guides us between them in the heavenly interim." "May he watch over you." "Is there anything you can tell me about the Restless League, Brother?" "I...know very little about their activities, Cyrus. The common stories, sure, but not much more." "I know even less of the League than you, Brother, the common stories included." "...And know they secretly served the Prince against the Forebears during the civil war, to help A'tor win back Sentinel." "What is the League's symbol?" "The red R, for restless, as they ever are. Trust me, you will see it if you stay in Stros M'Kai for long, invariably written in Imperial blood." "From whence A'tor was forced to flee soon after his father died. "Aye, but the Crowns gathered here at Stros M'Kai and charged northwards to take their throne-city back -- but, by then, the Imperial's bargain had been struck." "How is Stros M'Kai these days, Brother Nidal?" "You should be able to see it just from the faces on the streets, my boy. "But, then again, there aren't that many faces out there anymore. Things have become quiet since the occupation." "I have seen the Empire expanding into all of Tamriel in my travels. Why is the occupation of Stros M'Kai full of more bloodshed than most?" "You have only your Redguard blood to answer that, my boy. When has Hammerfell ever suffered foreign rule? "The civil war was bloody to be sure, but when the Forebears allied with the Empire, the Crowns felt they had been betrayed by their own kind. "They were prepared to fight to the last man, and the Empire sent Admiral Richton to make sure they did." "That the Forebears were the pretenders to the throne, that they betrayed the republic, and that Hammerfell has been cursed by their cowardice." "Iszara was a Crown, I know that. As a Crown, what would be her fate?" "I fear, sadly, that the Crowns' days are ended. The Forebears' alliance with Emperor Septim made sure of that." "What else do you know about Richton?" "That you should stay away from him, my boy. He will not care if you are a Crown or not, should he find out that you are Iszara's brother. "However, you are probably safe in the city for the time being, as he never leaves the Palace, it seems." "I escaped Hammerfell just before the civil war, and without regret. "That is probably why Iszara never mentioned me to you. It was only through a mutual friend that I learned of her disappearance." "The war cost this city much, Cyrus, though an outsider may not see it. The Crowns are gone, now, and only the League remains as their testament." "The temple seems very empty, Brother Nidal. Are you its only priest?" "We have ever been understaffed. It was horrible right after the battle, all the dead and dying, but luckily I had Brother Kithral to help me tend to them. "Since he is gone now, I must carry on alone." "What can you tell me about the Governor?" "That he is a hard man. Richton threatened to raze the temple when I refused to hand over the wounded of Prince A'tor who had survived the battle. "I assured him that even his Emperor could not defy divine law. Nevertheless, the wounded under my care were healed only to be thrown into the Catacombs thereafter." "He was... lost at sea, my boy. That is all I know. And... that it was rumored that Iszara knew him personally." Brother Nidal reveals that Iszara and the Prince were secret lovers. "Tell me about my sister and the Prince." "I'll tell you, my friend, for it might repay some of the kindness you have shown. Iszara and the Prince were seeing each other in secret, a doomed tryst in these shadows of war." "So my sister knew the Prince, then?" "Leave that alone, boy. That was but a rumor." "Did my sister fight in the Battle of Stros M'Kai?" "No. She was never part of the military. She could have been, though. She was good with the sword... I hear." "What is the Divine Law?" "Richton wanted to rescind the Crowns' right to sanctuary while they were wounded, or to desecrate the bodies of the enemy dead before I gave them their last rites." "So A'tor's men are in the Catacombs, then?" "Either that, or they are fruit for the necromancer. It is somehow appropriate that Richton deals with that nefarious slug." "What happened to the bodies of A'tor's men after their last rites?" "Food for the dragon, more than likely. But at least their souls are safe from the necromancer." "The Imperials have a dragon?" "Its name is Nafaalilargus, and it lives in the Catacombs, or so I have heard. "It has not been seen in the skies since the battle, so maybe Richton is lying about it still being around." "N'Gasta has been here long, manifest in Thassad's good rule. A'tor had kept his wretchedness at bay, but now, with the Prince gone, he has cursed the land." "How has N'Gasta cursed the land?" "The very soil of Stros M'Kai is cursed. N'Gasta has become very powerful and has weaved a soul-snare across the island. "Any who die must quickly have their last rites performed before their souls become his to claim." Nidal says that his former initiate, Brother Kithral, has disappeared. "Do you know anyone that Iszara may have kept company with, vanished nationalist or otherwise?" "Like I said, I knew her well. And she spoke often to Brother Kithral, my former initiate, but he, too, has disappeared. "She was a devout Arkayn, Iszara. I once almost convinced her to join the temple, but that was before she... well..."
Opens same subtopics as "Others". "Just another of Richton's rules, my boy, along with several other solutions to the burden of Empire." Nidal says that he last saw the missing initiate, Brother Kithral, heading for the park to collect mandrake roots. Nidal thinks Richton's men are responsible for Kithral's disappearance. "When did you last see Kithral?" "I sent him to the park for fresh mandrake root, and that is probably where Richton's men were waiting. "Kithral was against the Imperial expansion from the start, though I reminded him that Arkay frowns on more... secular interests. "This warning Kithral obviously did not take to heart." "Brother Nidal, I have bad news. I found Kithral's body in the caverns; he's dead. I'm sorry." "The caverns...? What could he have been doing there?" "I found his journal among the remains. You should read it." "Oh my...the poor lad...what did he hope to accomplish? Nidal revealed that A'tor's body is hidden in the temple, preserved from decay by a spell of stasis. Nidal suggests that Voa's ring could dispel a stasis field on A'tor's body, but gives no suggestion why Kithral or Iszara would try that. "Cyrus, I now count you as a friend. Kithral's fate is revealed, and I shall bring you into my confidence." "The body of Prince A'tor is here, at the temple." "Yes. It's the only safe place for it. We can't quite...bury it." "There is a spell of stasis upon it, to preserve it and stave off its decay. Archmage Voa enchanted it thus just after the Prince's death." Nidal suggests that Voa's ring could dispel a stasis field on A'tor's body. "Cyrus, I now count you as a friend. Thank you for this -- unfortunate -- news of my initiate; at least now I know his fate." "Archmage Voa is mentioned in the journal, and his magical ring, which both Kithral and my sister were looking for...."
"Voa's ring was used to enchant the Prince's body." "So they would have used it--"
"To dispel the body's stasis field." "Why would they do that? That would only serve to send the body along to rot." Nidal suggests that Iszara and Kithral planned to use Voa's ring to dispel the stasis field on A'tor body, thus enabling a transfer of A'tor's soul from the soulgem back into the Prince's body. "No, they meant to restore the Prince through the soulgem. The stasis field would have disrupted the transfer. They had to get rid of it." "It seems that they were going to bring the Prince back to life, so to speak, just as Archmage Voa preserved the Prince's body he also preserved his soul. "Voa separated both body and soul, and protected them both, hoping that he could one day heal the body and restore the Prince." "But Voa died too soon." Nidal agreed that Iszara and Kithral did not plan to dispel the stasis field on A'tor's preserved body just to let the Prince's body rot. They must have had some other use of the ring in mind. "Yes, you're right. It doesn't quite make sense, does it? "It's Redguard custom to preserve their great leaders in stasis so that they might be looked upon everafter in their prime. To break the stasis would be treason, or hubris, even." "There's something we're not getting yet. Both Iszara and Kithral were Crowns-whatever they had planned for the Prince would only have been for his benefit." "I am sure you are right." "Brother Nidal, did you know that Prince A'tor's soul was placed into a soulgem just prior to his death?" "Kithral never told me. I had no idea! And this would explain their search for the Archmage's ring...."
"The body was dying from the dark arrow's poison; it was the only way to save him. "What do you know about soulgems, Brother Nidal?" "Tis an aberration to the hard-liners among my vocation, who view the practice of soulgems as little better than necromancy. "The followers of Arkay see any interruption of the soul's migration as an evil not to be endured." "Really? Did you know the Prince's soul was placed in one of these vessels of evil? And that it is somewhere on this island." "So you didn't know this, huh?" "This news...has escaped me, thus far." Nidal says he can't work the soulgem's magic, that a mage is needed. "I have the soulgem, Brother Nidal. Can you work its magic?" "No, I can't, Cyrus. You need a mage for this, not a priest. The magicks are unalike in practice." Nidal says that I would need the soulgem to restore the Prince, and that the soulgem's magic is beyond his skill. Nidal says that the stasis field would block the soulgem's magic, even if a mage were available. "Besides, the body is surrounded by a stasis field. Even if you could find someone to work the soulgem's magic, the field itself would block the soul's transfer." Nidal says I need the ring to dispel the stasis field, but that the ring is also beyond his skill. "Besides, you need the ring, too, to rid the body of the stasis field so the soul can transfer. The ring, too, I cannot use. Do you even have it?" "Then you have everything you need to bring the Prince back." "Except for the wizard who can use them." "You need to find it, too, if you want to bring back the Prince." Nidal says he can't work ring's magic, that a mage is needed. "I have Archmage Voa's ring, Brother Nidal." "Ah, this will break the stasis field!" "No, I can't, Cyrus. You need a mage for this, not a priest. The magicks are unlike in practice. "Besides, you would need the soulgem, too, if you are to restore the Prince. The soulgem, too, is beyond my magic. Do you even have it?" To restore the Prince, find a mage who can work the magic of both the soulgem and ring. "Now you must find a wizard that can use both ring and soulgem to bring back the Prince." Nidal says the ring would only dispel the stasis field, causing the Prince's body to turn to dust. Find the soulgem to restore the Prince. "The ring by itself will do nothing but turn the Prince to dust, you need to find the soulgem to make him whole." A topic named "Palace" does not appear because the variable that enables it is never set. It would have been a subtopic of "Stros M'Kai" between "Richton" and "Civil War" and disappeared after escaping the Catacombs. "How could I get into the Palace?" "I will not help you do that, Cyrus. It is too dangerous." "I have slain the necromancer." "A season will pass before his foul net has likewise been slain. Though he cannot fuel it still, we must suffer until it is strewn to the winds and gone." The topic "Kithral's Journal" was intended to have some different dialogue after rescuing Iszara as well. It would have replaced all of the conditional dialogue and ended the topic. Unfortunately, it would have also caused a game-breaking bug if you rescued Iszara before giving Nidal the journal, preventing you from starting Raze the Palace. Nidal revealed that A'tor's body is hidden in the temple, preserved from decay by a spell of stasis. "Brother Nidal, I understand you have the body of Prince A'tor here at the temple." This page was last modified on 15 August 2018, at 06:53.